French Tarragon (Artemisia dracunculus): growing, planting, caring. Forget tarragon under plastic in the shops - grow your own ! French Tarragon is a woody-based, upright perennial with aromatic leaves and small, nodding, pale yellow flowerheads in late summer. Tarragon is an herbaceous plant about 80 cm tall, with many stems very branched, narrow-leafed, perennial by its stump. The leaves, narrow, smooth and shiny, dark green, disappear during the winter. French tarragon is often grown for cooking! Russian tarragon, Artemisia dracunculus var. inodora, having less flavor, remains less appreciated. If you bought a plant in a store, or got a clump from a neighbor or a friend and want to keep your tarragon potted, replant it immediately after purchase in a simple earthenware pot. Find a bright location, possibly outside, when the last frosts are past due! Your french tarragon needs to be protected from the frost, so place it indoors for the winter, in a bright spot. After the last frosts, gradually put your tarragon out in the light. Prefer a sheltered situation from full sun and wind. The soil must be well drained to avoid stagnant water: the best is a mix made of potting soil, with an addition of 10% sand. 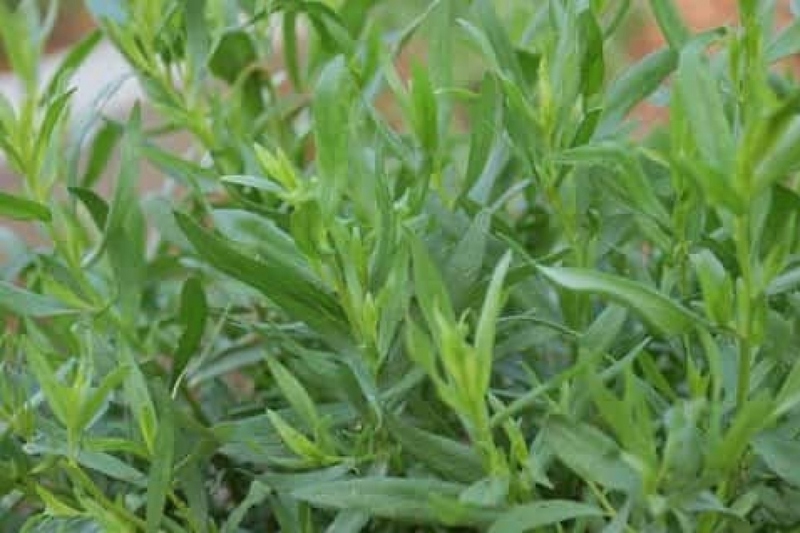 Tarragon is also perfectly suited for growing indoors, behind a window, or on a balcony, in a pot or in a planter: if you wish to keep it in pots, replant it immediately after purchase in a simple earthen pot. Find a bright location, possibly outside, if the frosts are past due! Tarragon tolerates drought much better than excess moisture. Water regularly the first weeks to promote rooting, and afterward only when the substrate has become very dry. You can pick leaves until the first frost arrives! Preferably choose the most important leaves by pruning a full stem to promote the emergence of new shoots. Remove withered stems too. During the winter, cover the base of your plants - which would withstand temperatures below -5 ° C, or mulch them if you want to keep them for the next season. If they are in pots, you can of course shelter them for the winter, and bring them back outside after the last frost!